California Prenuptial Agreements | Should You Get a Prenup? Most couples rightfully believe their marriage is the “happily ever after” sort. However, their odds are only 50/50, because about half of marriages end in divorce. This rate is even higher for subsequent marriages. With these facts in mind, fiancés should consider whether a prenuptial agreement, also known as a premarital agreement or prenup for short, is in their best interests. However strong love feels in the beginning, relationships change for better or for worse. Premarital agreements can protect the property rights and financial interests of each spouse if the marriage takes a turn for the worse, or if one of the spouses dies. 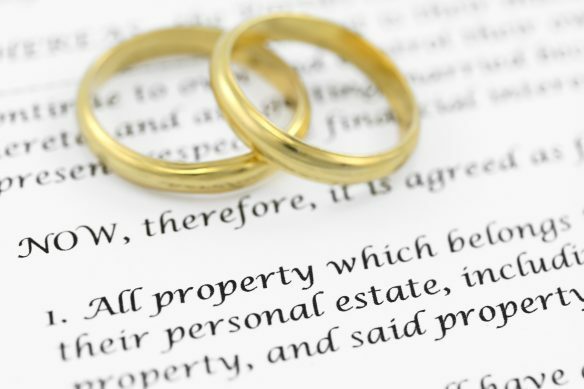 The rights and responsibilities of each spouse to property owned separately or together. Their capacity to manage, control, or dispose of real property and other assets in the event of divorce. The arrangement or placement of property in the event of separation, dissolution, death, or other circumstance. The obligation to pay, or the right to receive, spousal support after divorce, or while the divorce action is pending. The creation of a will or trust to carry out the conditions of the agreement. A spouse’s claim to the death benefit from a life insurance policy. The choice of law under which the agreement will be interpreted (i.e. California law or another jurisdiction). A California prenuptial agreement may also include provisions regarding debt liability, support for children from previous marriages, and the obligations of each spouse during the marriage, such as savings contributions or putting either spouse through school. However, premarital agreements may not include provisions regarding illegal activities, and will not be recognized if the contract does not adhere to California’s prenuptial agreement requirements. A complete disclosure of assets and financial obligations of the other partner. At least seven days to review the contract, either by themselves or legal counsel, before signing. Separate legal representation during the agreement’s creation and prior to signing, unless they voluntarily waived such right, or were fully informed of the provisions and effects of the agreement in terms readily understood. Even if these conditions are met, a California prenuptial agreement may still be overturned in court if the contract includes invalid provisions, such as terms that negatively impact a child’s right to support, or any portion considered unconscionable, meaning the terms are grossly unfair and might leave one spouse with undue hardship while the other disproportionately benefits. There are many reasons spouses might benefit from a California prenuptial agreement, including guaranteeing the protection of inheritance rights of children from previous marriages; preserving the interests of a business or professional practice in the event of divorce, ensuring a former partner cannot take over, control, or break up the business; avoiding assumption of the other spouse’s debt; and detailing each spouse’s share in household and financial responsibility and decision-making during the marriage. Of course, such agreements have their drawbacks, too. Under a prenuptial contract, a spouse might give up rights that they are otherwise guaranteed under California law, such as the inheritance of a portion of a deceased spouse’s estate, or receipt of spousal support. While an agreement’s provisions may seem fair or reasonable initially, especially during a couple’s “honeymoon” phase, the terms may not serve the best interests of both parties, or prove unduly burdensome, in the future. Before signing a prenuptial agreement in California, please contact Norman Dowler’s seasoned family law attorneys. With any contract, it is always best to seek separate legal counsel to ensure your best interests are protected.